This maven of the morning was coined the “world’s most complex cocktail” by the Daily Telegraph’s Max Davidson because of the number of ingredients that go into it. Our Bloody Mary has a wonderful vodka-based flavor with the perfect salty-sweet tomato taste countered with soothing celery. Its overall savory quality is evenly balanced with citrus notes. Mustard aromas complete this sensory remedy. Salt the rim of a 14 oz. Highball Glass and fill with ice. 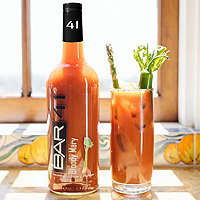 Bar41™ Bloody Mary Cocktail and ice. Place top on shaker and give 3-4 shakes. Garnish with celery, a strip of bacon, and asparagus for our original. To spice it up, add a variety of hot sauces and/or peppers.